Locum work, what is it all about? By request of the #OTalk community the discussion on the 25th February will be exploring the topic of working as a locum. Rehana @LabmedOT has kindly volunteered to support this chat. Rehana has written this introduction to get the discussion going. We hope that anyone thinking of exploring work through a locum agency and those that have already done so will join us to explore this aspect of the working community. I’d like to thank #OTalk for the opportunity to help provide more information on locum options for both new graduates and experienced workers. There are two ways to get into a role for newly qualified Occupational Therapists. The first is starting as a Band 4 Assistant and then building up a few months experience within the NHS before moving into a Band 5 Occupational Therapy role. The second is the New Graduate Scheme which is provided in the North West of England, this allows new graduates to go straight into work as a Band 5 with Band 6/7 support in place. Certain agencies will hold contracts with NHS Trusts across the UK. For example Derbyshire Community Healthcare Services which covers a large number of hospitals in the area has a contract with only a couple of GPS approved agencies. It’s important to remember to be as prepared as possible with the above documents when joining a new locum agency as this can cut down time between registration and you being placed into a role. Once you have a couple of years postgraduate experience as an Occupational Therapist, more options will become available to you regarding both location and pay rate. I’ve found that managers are very welcoming to Band 5 and Band 6s who are able to jump into roles and hit the ground running. There are a wide variety of roles available through locum agencies ranging from Band 3 Rehab Support Workers through to Band 8a Managers. 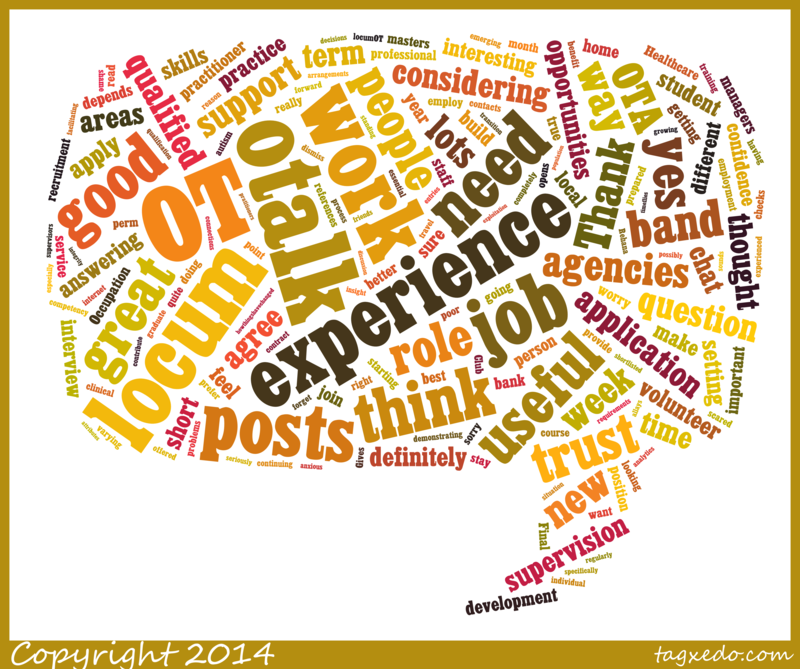 • What are your expectations from a locum agency? • If you have already been a locum, what have you found useful that you can share with new starters? A very informative chat between 33 tweeters, generating 360 tweets. Healthcare hashtags tells us this means the OTalk community made 357,377 impressions on those that follow the individuals of our community. Link to the HealthCare Hashtags transcript here. PDF of the transcript #OTalk – Healthcare Social Media Transcript 25 Feb.
Just because I like them, a wordcloud of the tweets from the chat.